This worksheet is intended to help students review the anatomy of the frog after they have completed the dissection of the frog. 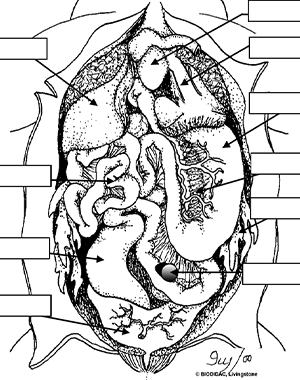 Images show the internal anatomy of the frog with blanks for students to fill in the names of structures, like the liver, intestine, lungs, spleen, and heart. Guide also compares the male and female reproductive systems of the frog with students labeling the kidney, urinary bladder, cloaca, testes and oviducts. A review of the mouth is also included, where students review the location of the eustachian tubes, glottis, esophagus, and other structures related to the external anatomy.